【鉱物】 石英，クォーツ 《★その透明な結晶が rock crystal (水晶)》. a quartz clock [watch] クォーツ[水晶]時計. From German Quarz, from Middle High German (Central East German) quarz, twarc, from a West Slavic language [compare Polish twardy (“hard”), Czech tvrdý (“hard”), Russian твёрдый (tvjórdyj, “hard”)], from Old Church Slavonic тврьдъ (tvrĭdŭ, “firm”), from Proto-Slavic *tvьrdъ. (mineralogy) The most abundant mineral on the earth's surface, of chemical composition silicon dioxide, SiO2. It occurs in a variety of forms, both crystalline and amorphous. Found in every environment. The telescope and collimator have each an object-glass consisting of a single lens of quartz 1½ inch diameter and a focal length of 18½ inches for the sodium yellow light, but not more than 16 inches for the highest rays measured. Subsequently, the old Malay brought him the present specimen in a state of torpidity, telling him he had found him it in a cavity of the quartz reef. My meat eats me. Who waits at the gate? / Mother of quartz, your words writhe into my ear. / Renew the light, lewd whisper. 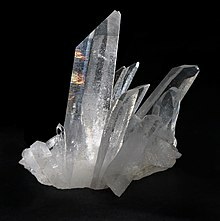 Quartz is the second most abundant mineral in the Earth's continental crust, after feldspar. It is made up of a continuous framework of SiO4 silicon–oxygen tetrahedra, with each oxygen being shared between two tetrahedra, giving an overall formula SiO2.